Traditionally the browser initiates the request to the server and the server reacts with an answer. If the server tries to send some information in return the options are limited. The oldest way is via “Comet” which is a collection of tricks. That means the client initiates a request and it won’t close until informations from the server are transmitted. Principally the connection is open all the time. Well this isn’t the classiest option. Another way is to use the so called “Server Sent Events” which are supported by almost every browser – besides IE. Older IEs have to use the “Comet” way. The latest alternatives are so called WebSockets. A TCP connection between server and client is build and at the same time a bidirectional in the opposite direction. WebSockets have to be supported by not only the browser but also by the server. In IIS they are official supported since IIS 8.0. That means only with Windows Server 2012 and above. 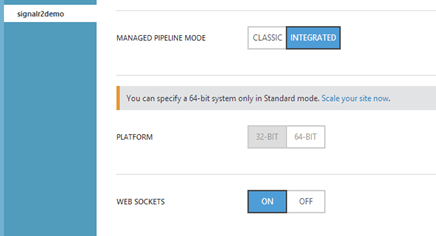 Before that there is no way to activate them in the IIS pipeline. The browser supports WebSockets since IE 10. Chrome and Firefox offer the support also in earlier versions and the feature is implemented in all modern browsers. Since there are several ways of “protocol-types” that depend on support from both the client and the server it is not inappropriate to build and App. That’s where SignalR gets into the game. SignalR builds the best possible connection automatically and also it has a very impressive program model. SignalR is open source and the code is available on GitHub. Still you will get support from Microsoft (if needed). The server defines a hub and it calls “client-functions” with the API like for example “hubMessage”. 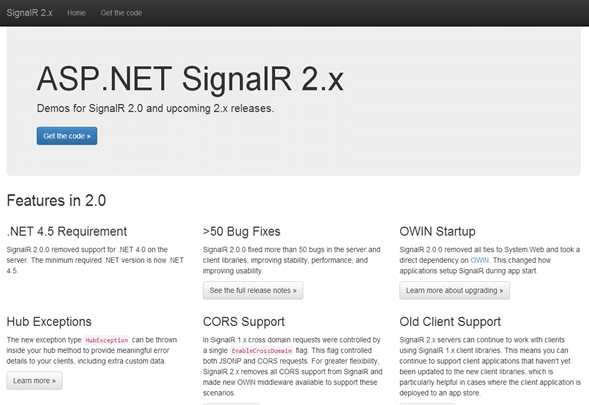 What’s new in SignalR 2.0? What’s great on SignalR: the “transportation way” is unappealing because SignalR takes care of this for you so you can concentrate on the main functionalities.